It's July! The sun is out and it is hot! If you are like me, your garden (ahem, and blog) may be a little neglected this month. It's a busy time of year with picnics, weddings, and outdoor fun! I came home to some wilted tomato plants this weekend and realized I needed to water. Luckily, they will forgive me once or twice. But what can you do if it's going to be a "hot one" and you are going to be gone, or don't have time to water in the morning? 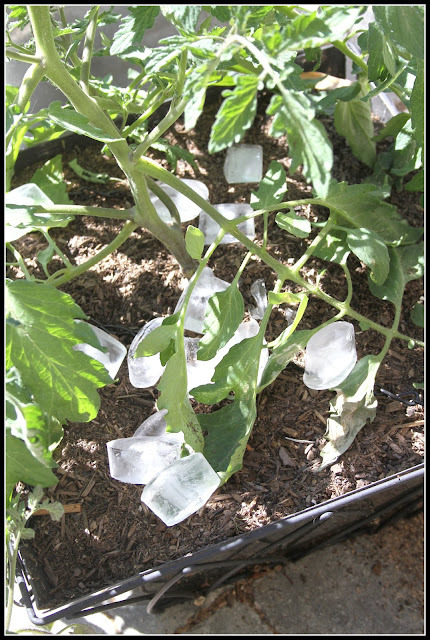 Try placing a handful of ice cubes around the base of your tomato plant. The ice will (hopefully) melt slowly, which will give the roots a gradual supply. This is a perfect solution for tomato hanging baskets that dry out quickly. Make sure you don't use your mint ice cubes though!